Match Me is a tool designed for employers to indicate their preferences for their ideal helper and vice versa. Based on our matching algorithm, employers will be able to choose helpers who are most suitable for further selection and interview. Today, we will run you through Match Me’s registration steps for employers. 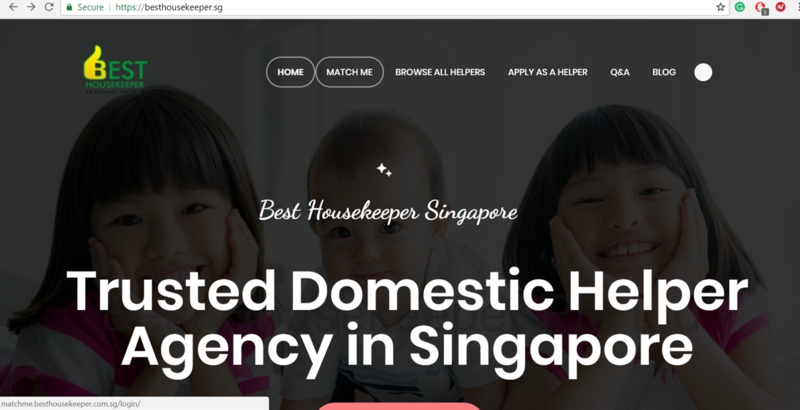 1) When logged onto our website, https://besthousekeeper.sg/, you will be able to see the ‘Match Me’ icon tab on the top the page beside the ‘Home’ icon. 2) Once you have clicked onto the ‘Match Me’ icon, it will redirect you to a page as seen below. To fill in your General Details, click on the ‘Employer’ button and type in your desired username followed by your preferred email address for ease of contact. 3) Once you have filled in your username and email address, click onto the ‘Next’ button to proceed. 4) You will now land onto the Contact Info page where you will need to input your First Name (given name) and Last Name (family name) followed by a contactable phone number with your country code in front. Lastly, you will need to type in your desired password once and then type in the same password at the ‘Repeat Password’ section to ensure the passwords are corresponding to each other. 5) After you have finished filling in all the information, click ‘Register’ to confirm your registration and a prompt to validate OTP (One Time Passcode) will appear. Now you will need to open an SMS sent to the mobile number that you registered on the previous step. The SMS will contain a 6-digit OTP and you will need to enter it into the prompt for your registration to complete. 6) Once the OTP is successfully verified, your account will be created. 7) Now you can click onto the ‘Log In’ icon on the top right of the webpage to log into your newly created account. 8) Upon logging in, there will be a Questionnaire Form to fill up so that we can find you the best match for your ideal helper. 9) When you are finally done with the questionnaire, you will be shown with a list of helpers in our database that matches your requirement as you stated earlier on. With that, you will be able to search for your ideal helper and arrange for an interview with them in no time.